Achhruram Memorial College, Jhalda, located just at the entrance of Jhalda town on the Purulia-Ranchi road, is an important landmark. The college covers a moderate area of 26 bighas of land including a pond, a garden, some agricultural lands and the college buildings. The decently painted college building in the midst of the greeneries of rows of tamarisk trees at the background of deep blue sky and far-off hills makes the college stunningly beautiful, visually. Academically, the college provides Honours courses in six Arts (History, Bengali, English, Economics, Geography and Philosophy) and five Science (Physics, Mathematics, Chemistry, Zoology and Botany) subjects and an array of general degree course subjects. Total number of students at the undergraduate level, at both General and Honours levels, both Arts and Science streams, is more than 1500. 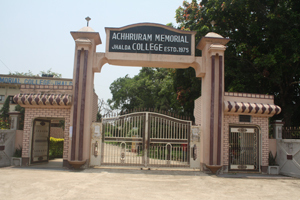 Achhruram Memorial College, Jhalda started functioning since 1975 with its motto of "Spreading Higher Education to the Grass root level of the Society" of this part of the district of Purulia. In its early days of inception the College used to have average roll strength of two thousand students per year with Higher Secondary stream. At present the roll strength of the college is one thousand and five hundred students. The College has provided each and every village of the area with at least one or more graduate/graduates. This indicates that the Institution is proceeding in the right direction towards its declared goal. I personally feel privileged to have the responsibility of guiding the College from the front with the contingent of dedicated teaching and non-teaching personnel staff to fulfil its goal. We have distinguished place among the colleges of the district and of the university. Contents provided and maintained by: Achhruram Memorial College, Jhalda, Purulia, West Bengal, India.